When purchasing a piece of jewelry, look carefully at the construction and quality of workmanship. The way the piece is designed, constructed and finished will have a major impact on how well the piece wears and holds up over time. We partner with jewelry manufacturers worldwide to get the finest quality jewelry at the most outstanding prices. To be certain that your jewelry has been evaluated by a trusted third party, get it appraised by a local jeweler and you'll find that our jewelry, designer clothing & designer handbags will be appraised 30 to 60% above retailers price. You can easily spot the fake handbag with the designers logo alone. Most designers usually place their product's signature on the same part of their every designer handbag so that buyers would know that it's the real handbag. All our designer clothes and designer handbags come with original designer authenticity card and tag. Sparkle N Dazzle guarantees that the diamond you purchased has been graded with the strictest standards using the Gemological Institute of America grading systems. The sapphires, emeralds, and rubies in the gemstone jewelry we offer will display rich blue, green, or red color. And each gemstone must be translucent — not opaque like the gemstones found in much of the gemstone jewelry available. 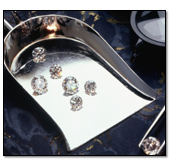 You'll find we offer only the strongest, most durable jewelry grade platinum. Pearls in all our cultured pearl jewelry will have medium to high luster. Our designer clothes & designer handbags are 100% authentic and are at least 50% discounted. Everybody dreams of having fabulous designer handbags of the finest quality that one can only see in a celebrity's hand. However, such leather handbags are difficult to find and quite expensive. Sndgems wants to provide the most enjoyable and risk-free shopping experience possible, so we have implemented several programs to ensure that you feel comfortable and satisfied with your involvement with us. Assurance of value, a quality jewelry owner wants. Sparkle N Dazzle has a team. Qualified, certified professionals provide that assurance. We provide complimentary third party appraisals on our jewelry worth $2500.00 or more, so you can be certain that your diamond jewelry has been evaluated by a trusted third party. Our designer clothes & designer handbags are genuine and come with a designer price tag. A good designer handbag will withstand the test of time. A good handbag can be proudly passed from a grandmother to her excited granddaughter. Fendi handbags are popular and cost as much as they do because first and for-most they are made from quality materials. View Details. Our products are backed by 100% satisfaction guarantee. If you aren't satisfied, you can return for a no-hassle refund or exchange 30 days from the date of purchase. Sndgems.com Online Jewelry Store offers Authentic Jewelry with Genuine Gemstones, Certified Diamonds and Real Metals. Read More. We're confident you won't find a better quality diamond or piece of jewelry, genuine designer clothes and discount designer handbags for the price. All fine jewelry, 100% authentic designer clothes & designer handbags are genuine, authentic and of consistent high quality and value.